1. How do I set up a league on MyFantasyLeague.com? 2. How do I set up a keeper/dynasty league draft on MyFantasyLeague.com? 3. How do I set up my Salaries and Contracts for players on MFL? First you must enable the option on the Setup > General League Setup to use Salaries/Contracts. Next you will need to set the Salary Cap for your league on the Setup Salary Cap Setup. Use MFLs predefined salaries in the Setup > Select Packaged Players Salaries. Note you will first need to define the "Per Franchise Salary Cap" on the Salary Cap Setup screen to populate this. These are available in mid-July. Multiply all last season end-of-season player scores by a value on the Setup > Select Packaged Players Salaries to generate the salaries for players. Enter the salaries manually through the For Commissioner > Setup > Enter Players Salaries/Contracts. Run an Auction to determine players initial salaries. Copy Salaries from an existing league in the Setup > Select Packaged Players Salaries. Use the Import Salaries to import salaries to the site. To set default salaries for players who do not have a salary or contract go to the For Commissioner > Setup > Enter Players Salaries/Contracts. In the Top Field enter the "Default Salary/Contract Information" and select the Save Salary/Contract Information button at the bottom of the screen. Then on the Setup > Salary Cap Setup you can enable the option "When a player is acquired that does not have a salary/contract, assign the default salary/contract to him?". To define contracts for players this must be done manually by the commissioner on the For Commissioner > Setup > Enter Players Salaries/Contracts. You can filter by rosters or all players to define each players contact length (use a numerical value such as 2 for a 2 year contract). This will allow you to decrement each season. Fields such as the "Contract Status" and "Other Contract Information" are additional fields you can use to track player information. This will be displayed on the Reports > Franchise > Rosters Report. You can edit the titles of these fields on the Salary Cap Setup. If your league wishes to set a contract cap for your rostered players you can enable this on the Setup Salary Cap Setup. Players contracts will then be totaled and tracked. You can set up penalties for players on IR or Taxi to be applied to the rosters on the Setup Salary Cap Setup. Here you will define a percentage of the players salary that will be charged to the Salary Cap. This will appear on the Reports > Franchise > Rosters. You can also apply a percentage of the salary as a penalty for dropping a player. This will appear as a Salary Adjustment on the Rosters. Each season as you upgrade this Adjustment will remain until deleted. Additionally, you can Multiply The Above Percentage By The Number Of Contract Years For The Player When Determining The Penalty. Example: You had a player with a $10 Salary and 3 year contract. You apply a 50% penalty for players when they are dropped. If you drop player A you will be charged $15 against your cap ($10 x 50% = $5 times 3 years = $15). NOTE: that if you apply a percentage for dropped players, IR or Taxi and that player has a Contract the full contract will still be included in the total contract years if your league has a contract cap. Each season when you upgrade your salaries and contracts will automatically carry over upon upgrade. You can either clear out these salaries and set new packaged options (see above) or keep the current salaries/contracts (for keeper/dynasty leagues). Keep the Current Salaries : This action requires no changes. The salaries will simply copy as they were the previous season automatically. Multiply all Salaries by a Percentage: Go to the For Commissioners > Setup > Salary Cap Setup. Enter a numerical value in the field that states "0Automatically Increase All Player Salaries by:"
HINT: Enter a negative number to automatically decrease all player salaries by that amount. This is a one time field, so once you enter a value and save the page it will apply the increase and clear the field for the next time you visit the page. Go to the Reports > Players > Top Performers screen and filter the players you wish to keep their salaries or the Reports > Players > Rosters. Export the Salaries into Excel, See the following FAQ for details. You can now modify any salaries for your Rostered Players in Excel as needed. For all other players, use the Packaged options as described above and found on the Setup > Select Packaged Players Salaries. When you upgrade each season you will need to decrement contract years for the players. Go to the For Commissioners > Setup > Salary Cap Setup page, and use the 'Automatically Increment All "Contract Year" fields by: -1' option to automatically reduce all contract years by one. This field is a one time field, so once you save the page the adjustment will be applied to your league and the field will be cleared again to be able to be applied to the future years. If your league chooses to apply penalties to players for being dropped then these will be applied as a Salary Cap Adjustment. Owners can view these breakdowns on the Report > Rosters and click "Salary Adjustment" under their roster. Each season when you upgrade these adjustments will remain against that franchises cap. As commissioner you will need to go to the For Commissioners > Setup > Edit Salary Adjustments and delete those adjustments that no longer apply. 4. How do I decide what draft is right for my league? MyFantasyLeague.com offers a variety of ways to assist your league in holding it's draft. Understanding all of the options and when they are best used can be very helpful to your league's draft experience. Drafts can also be broken down by physical location. All your league members get together in one place to hold the draft. Most (all) of your league members are geographically separated. Now that you've determined the best draft for your league, the next step it to understand exactly how to prepare for it. 1. Offline Draft without internet-In this low-tech classic approach where all members are together for the draft, one person simply records all the picks on paper. At the completion of the draft, the commissioner must use the For Commissioners > Setup > Load/Unload Rosters option to manually enter in each team's draft picks. NOTE: Alternately you can recreate the draft online when conducting an offline draft. To do so you would set up the online Live Draft option and enter the picks. This will generate rosters and provide you with a draft report. See this FAQ for more details. 2. Online Email Draft with MFL- This fully Internet-based draft requires each owner to have access. (Owners without Internet access can still contact the commissioner to have him/her enter their picks as needed). 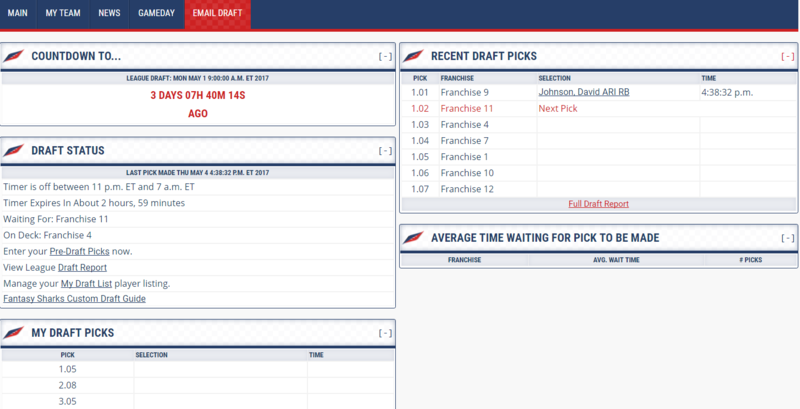 These drafts are intended to run for days/weeks, allowing owners to make picks remotely when they are on the clock. Owners are notified via email or text message when it is their turn to pick. 3. Online Live Draft with MFL- This fully Internet-based draft requires each owner to have access. (Owners without Internet access can still contact the commissioner to have him/her enter their picks as needed). These drafts are intended over the matter of hours and all (or most) owners would be online at the same time. Go to For Commissioners > Setup > General League Setup and define the option "Initial Rosters Set by" to use the "Manually Load Rosters" setting. Bring paper and pen (or similar) to the draft. Record each pick as it occurs for the entire draft. Choose a franchise from the pull-down list. Select all the players for the chosen franchise. You can either highlight the players in the left-hand window and click on the 'Add To List' button or you can copy/paste/type in the player names in the free-form text box below. When finished, you MUST click on the Load/Unload Rosters button to actually add these selected players to the chosen roster. View the complete rosters on the Reports > Franchise > Rosters when complete. 5. How can I conduct my auction on MyFantasyLeague.com? 1. Offline Auction: In this low-tech approach where all members are together for the auction, one person simply records all the winning- bids and the corresponding amounts. At the completion of the auction, the commissioner must use the For Commissioners > Setup > Load/Unload Rosters screen to manually enter in each team's wining bids and (optionally) the For Commissioners > Setup > Enter Player Salaries/Contracts screen to specify the corresponding bid amounts. 2. Online MyFantasyLeague.com Email Auction: This scenario involves using the MFL league site to directly hold your auction and is designed for auctions taking days or weeks to complete. 3. Online MyFantasyLeague.com - Live Auction: This option is for leagues in which all the owners will be online and wish to conduct a Live Auction in a matter of hours. 1. Go to For Commissioners > Setup > General League Setup and define the option "Initial Rosters are set by" to use the "Manual Load Rosters." setting. 2. Bring paper and pen to the draft. 3. Record each winning bid and amount for the duration of the auction. NOTE: You can track this information in a Spreadsheet entering the Roster Player’s name and winning bid amount if you wish to have this amount be the players salary and then import this information. 4. Go to your league home page and select For Commissioners > Setup > Load/Unload Rosters. Add each player won to their appropriate roster. Option 1: Use the > Setup > Load/Unload Rosters screen to use the “Add To” list to add players to each franchise. 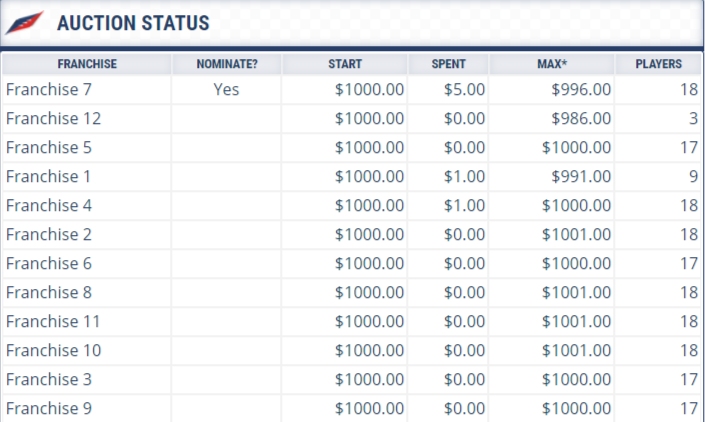 Then go to the Setup > Enter Player Salaries/Contracts to define each players salary. Option 2: Use the Setup > Load/Unload Rosters screen to use the Free Form text box to enter the Players Name and Salary Amount (no $ sign). NOTE: This option has prone to error if you did not properly enter the players name. This feature works best when copying/pasting from a spreadsheet. 6. How do I prepare for my Live online Draft on MyFantasyLeague.com? So, you're considering running your "live draft" via the MyFantasyLeague.com web site? Great! Since your live draft is one of the most important parts of the season, it's essential that you do a little preparation for running your draft on-line, to make sure it goes as smoothly as possible. Therefore, we strongly encourage you read and understand all of the following potential "gotchas" related to running your live draft on the MyFantasyLeague.com site. First, determine if a MFL live on-line draft is really what you want to do. We recommend live drafts on MyFantasyLeague.com only for leagues that want to conduct a draft all at once, where the owners are geographically separated. If you'd like to conduct your draft in a more "slow" email-type fashion, we do not recommend the use of the live draft feature. For a more detailed explanation, please visit our Commissioner Tutorials > league_id&FAQ=604>How do I decide what draft is right for my league? page. 1. Go to the For Commissioners > Setup > General League Setup screen to specify "Live MFL Draft: On-line, live draft that happens all at once, taking a matter of hours to complete." Use the For Commissioners > Setup > Draft Start Date/Time Setup screen to define the time in which your first draft pick *may* be made. Your draft can, but does not have to, start at this exact time. It cannot start before this time. This will allow all owners to access the live draft room and the owner with the first pick can make their selection. Once that pick is made it will start the clock. NOTE: If you don't see the Draft Setup screens, you will have to go to For Commissioner > Setup > General League Setup to enable one of the 'online draft' settings. Define the overall draft order and round of your draft on the Setup > Draft Order Setup - All Rounds screen. Here you will set the Round 1 Order and enter the number of rounds for your draft. Note the default is the Roster size. 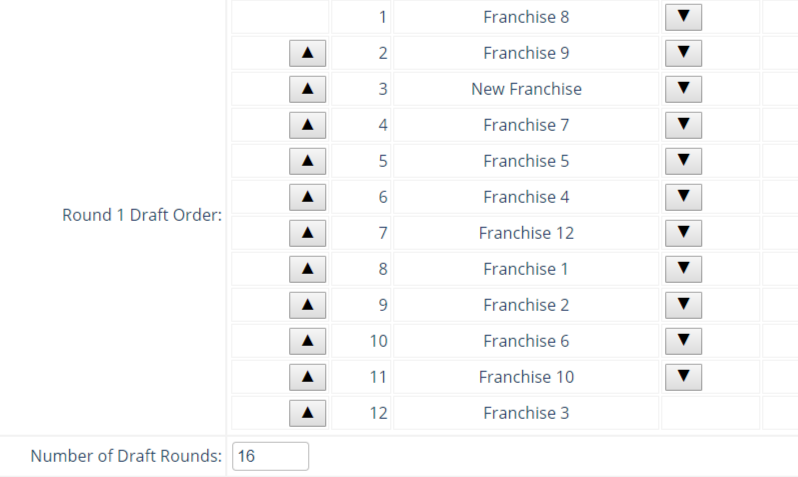 Once you have set your initial order for your franchises for round 1 you will select one of the "Draft Type" options to generate the remaining draft order for your league. The first round is as set up above, and each successive round of the draft is the opposite order of the prior round (an "S" or "serpentine" draft). The first round of the draft is randomly selected, and each successive round of the draft is the opposite order of the prior round (an "S" or "serpentine" draft). All rounds of the draft are randomly picked. All odd rounds of the draft are randomly picked, all even rounds are the opposite of the previous round. The first round is as set up above, and each round of the draft is the same order as the first. The first round is as set up above, and then it's a "3rd Round Reverse Serpentine" draft (1-N, N-1, N-1, 1-N, N-1, serpentine for the remainder of the draft). The first round of the draft is randomly selected, and then it's a "3rd Round Reverse Serpentine" draft (1-N, N-1, N-1, 1-N, N-1, serpentine for the remainder of the draft). Then you can choose to "Send Email To Owners Regarding How Draft Order Was Generated?" Should you need to adjust additional rounds of your draft you can use the Setup > Set Draft Order Setup - One Round. Use this screen to manually adjust any rounds as needed. Start by selecting the Round in which you wish to edit. Next you can select a Franchise from the left column in the list of "Available Franchises" and click the "Add to List". You can then use the "Move Up" and "Move Down" buttons to place the pick in the appropriate spot. Then be sure to save the Draft Order for that round. You can then re-access the page to modify additional rounds, or add more than 1 pick to a round for an owner. The comments on the draft report will always show the last pick as the "Added" pick, regardless of where you place the owner in the draft order. 5. Importing Draft Picks (for Upgraded Leagues) Should you allow the trading of draft picks each season you will need to import the traded picks from the prior year into your Draft once this is defined. Go to the Setup > Import Future Draft Picks. This screen will show all traded draft picks that occurred in the previous season. You will then use the "Import Traded Future Draft Picks" to automatically apply these into your draft order. Should you not have any traded picks from last season you will need to click the link where it states "DELETE THE UN-TRADED 2017 DRAFT PICKS NOW". That will clear the duplicate picks that will display for owners on the For Owners > Trades screen. Next go to the For Commissioners > Setup > General Draft & Timer Setup screen to set the time allotted between picks and what occurs when this timer expires. Set the length of time between picks. This is the amount of time that the owner will have on the clock to make their pick before the timer expires. This is NOT the overall draft length, but the timer that will appear in the room to make selections before expiring. For example, you want 2 minutes between each pick. NOTE: The draft timer cannot be suspended for Live Drafts. That feature only applies to Email (long running) drafts. NOTE: The timer can be changed at any time during the draft and can be turned on/off at any time during the draft. Even with the timer off owners can continue to make picks. When the draft timer expires: - The system will always first attempt to pick a player for the owner according to the owner's "Work List" in the Live Draft Room, and then the owner's "My Draft List." Skip the pick. The league commissioner may then use the For Commissioners > Setup > Draft Setup > Change Draft Pick option to pick the appropriate player to compensate for the skipped pick, if league rules permit it. Pick a player according to rankings generated by Fantasy Sharks experts. For current rankings check Links > Fantasy Links > Player Rankings on the main menu. Pick the highest ranked eligible player according to the Average Draft Position rankings among similar leagues as shown on the ADP page. NOTE: Starting in 2019, this option also applies to picks made while the franchise is in 'Auto Pick' mode (either because they timed out a number of times as indicated by the setting below or because they manually indicated they are 'Away' in the draft room). There are 2 options you can enable to help speed up the drafting process for your owners should they continue to time out on their picks or know that they will be unavailable to draft and wish to have the picks immediately selected off their My Draft List or Player Rankings. When a franchise times out this number of consecutive times, automatically pick for them as soon as they get on the clock - Enable this option to place a team on autopick as soon as they are on the clock if they time out a set number of times in a row. The owner making a pick or pre-drafting will turn the autopick off for that owner automatically. Automatically pick for these franchises as soon as they get on the clock - By default the system will wait until the timer expires before using the highest ranked My Draft List player or Player Rankings to make it's selection. If there are one or more owners that will not be present during your draft and you'd like to have the system auto-pick for them as soon as they get on the clock, check the appropriate box for each franchise. NOTE: The "My Draft List" player listing can be used for an owner's pick before the "Player Ranking" player listing, allowing an owner who either has had a pick timeout, or, an owner who cannot be present for a draft, to create their own personalized draft list to have the system select from. Now on the For Commissioners > Setup > General Draft & Timer Setup screen define the remaining draft parameters for your Live Draft. Select the Voice To Use For Audio Clips In Live Draft. Here you have 3 options, or "None" if you do not wish to use audio. This will announce the names of the players when they are drafted. Owners will be able to change this voice in the live draft room. Force an owner to confirm his pick in the live draft room via a pop-up window before making it? - You can enable this option to require the owner to confirm their selection when drafting. This prevents errors when making selections as it requires the confirmation of the player when "Draft" is selected. Begin by turning the timer"On at all times" if you wish to limit the time between each pick in your draft. Alternately you can leave this "Off" to not limit the owners. Available Player Pool For This Draft - If your league's draft is a rookie-only draft or vet-only, turn these options on to prevent owners from drafting non-rookies or non-vets in your draft. Finally, be sure all owners have already accessed the site and make sure that they have linked their MFL Accounts to their team. You can verify this on the For Commissioner> Setup > Invite Franchise Owners. If you are an existing league be sure your owners remember their MFL Account information so that they can access the site and the draft. Your draft is now setup. Go to Reports > League > Draft to verify your draft order. In a Live Draft it is very important to be aware of the pre-drafting and My Draft List Features offered on MyFantastyLeague.com. It is also incredibly important that you can access your live draft room and familiarize yourself with these settings. This is probably the most important step of all - all owners need to at least experiment with the live draft pages a little bit before the start of your live draft to make sure that they don't have any problems accessing those pages and get a general feel for how things work before your draft actually starts. Otherwise, you may well spend the first half-hour or more of your draft just making sure everyone is logged on properly, and understand what they need to do on the site. This also confirms all browser and compatibility issues for computers and mobile devices prior to the draft day. Any pre-draft picks submitted by an owner will be selected as soon as it's that owner's turn to pick for that given pick of the draft. In other words, if you have submitted pre-draft picks for round 2 of your draft, as soon as the team before you in round 2 picks in your draft, the system will go through your pre-draft list at that time (even if you're actively logged into the draft!) and make your pick for you. If an owner has to step away from his computer for a moment for whatever reason during a live draft, he may want to pre-draft for an upcoming round or two so as to not hold up the draft while he is away, so the system can automatically make his picks for him. NOTE: You will never want to draft multiple rounds, but instead use the My Draft List option. In the event that you pre-draft picks and the list is exhausted the draft will be halted until a legitimate pick is selected by the owner. For details on how to specifically set up this list see the FAQ: How do I Predraft. 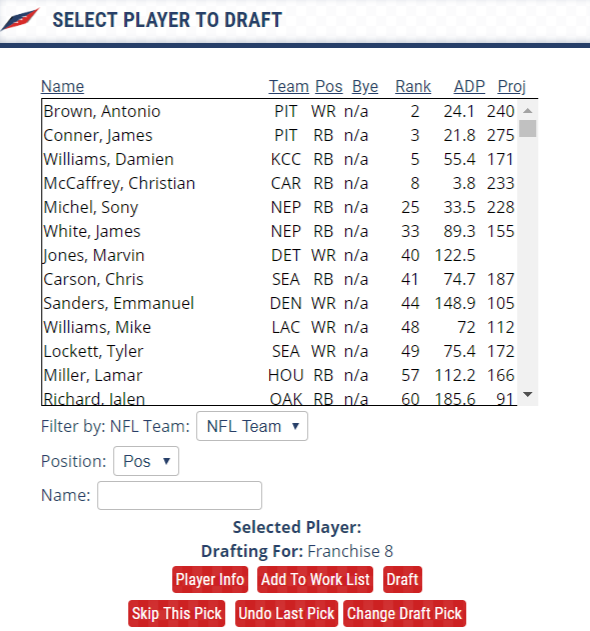 My Draft List: The "My Draft List " feature allows owners to set up a personal draft list for picks, without automatically having those picks made as soon as the team is on the clock. It should be thought of as more of a personally-defined draft guide. This is helpful during the draft as the players will be automatically removed from your list in the room as they are selected. Also in the event that you miss your pick, or the timer expires, the system will automatically select the next highest eligible player on that list. For details on how to specifically set up this list see the FAQ: How do I setup My Draft List . The "ADP" report – Average Draft Position feature on the MyFantasyLeague.com site. -The "ADP" feature was designed to make a pick for an absent owner. Using rules described in the How does the ADP Report (Average Draft Position) work and know which positions to fill for my Roster?, owners that allow the timer to expire may be able to have the system make an intelligent pick (based on other 2019 completed drafts) on their behalf. The FantasySharks.com Player Rankings will provide better guidance than ADP for most leagues since the ADP rankings are an aggregate of ALL drafts on MyFantasyLeague.com, and there are hundreds of different league configurations which can lead to very different draft patterns depending on the type of league. EXAMPLE: the most common league is a 12-team redraft league with PPR scoring and only offensive players (QB, RB, WR, TE, PK, Def). If your league has more or less than 12-teams, or doesn't use PPR scoring, or uses more positions (or combines some positions such as RB+WR), then the ADP may not have enough similar leagues to generate meaningful values for your league. If that's the case, then an overall list of players like this one will provide more relevant and complete rankings for you to use as guidance. So your draft is finally here. You have set up all the parameters as described above and your owners have accessed the live draft room from their computer or mobile device prior to the start of the draft to get a feel. Start by making sure all owners have accessed the Live Draft Room which can be accessed through the For Owners > Live Draft Room. You can verify their status in the "Live Chat" to ensure they are ready to begin. After the time has passed to start on the League Calendar the draft timer will not begin until pick 1.01 is drafted. NOTE: The commissioner will have the ability to Pause, Resume, Stop/Start or Edit the timer in the draft room. MAKE A DRAFT PICK - Owners will go to this module to highlight a player from the player list. They can use the filters to sort by the ADP, My Draft List (if created) or Alphabetically. You will also be able to filter by position or search by name. If it is not your turn to draft you can highlight players and click the ">" button to Add them to the "My Work List". This list can be used during the draft as picks are made to help make your next selection. You can order this list as needed during the draft. It will not automatically draft off of this list, but this is used just as a guide for a franchise during the draft. When it is your turn to draft you must highlight the intended player and click "Draft". NOTE: If the option to confirm your pick has been enabled by the commissioner on the Setup > General Draft & Timer Setup screen then a pop-up will appear requiring you to confirm your selection. PLAYER INFO: When highlighting a player you can view the player Profile at the bottom left of the screen. MY WORK LIST: When waiting for your pick you can create a Work list that will allow you to add players and then draft from that list. The system will automatically pick the highest player from that list when the timer expires if such a list is created. This list will appear below the players to select and you can draft form this list when it is your turn. DRAFT MESSAGES: This module will display various notes throughout the draft, such as paused timers, changes in draft picks, auto-picking due to timer expiring, etc. This helps track various functions during the draft. DRAFT PICKS: As players are drafted the Draft Report will update with each selection. NOTE: if you trade a draft pick in a Live Draft you will need to reload the page in order to update the new order. ROSTERS: Your roster will populate on this screen as the players are drafted. You can select any Franchise to see their specific roster. It will also display the starting lineup requirements for your league as a guide for drafting. DRAFT CHAT: This is used to chat (or trash talk) with the other owners in your live draft room. NOTE: These messages are not saved. This is only used during the draft and will display up to 40 messages in the Communications > League Chat. There is not an option to maintain a history of this chat. Finally, understand what to do in case of unexpected problems during your live draft. For an important real-time event like a live draft, if things go wrong, they can snowball in a hurry. You need to be sure that even after you've done all of the above important steps, you consider the following. If you find that people are having problems getting access to your live draft, and the system is still advancing your draft due to the timer expiring, the first thing you should do is turn OFF your draft timer via the Setup > General Draft & Timer Setup page for a round or two until everything smooths out a little, and then turning it back on. Skip Pick – select this item to advance the draft by one pick without making a selection for the current pick. Undo Last Pick - select this item to revert the draft by a single pick. You can also use item "b" below to undo multiple picks quickly. Change Draft Pick – click on this link to be taken to the Setup > Change Draft Pick Page where you can replace a pick for an owner. Pause Timer - use this to stop the timer in a live draft. This action will only pause the timer and not prevent owners from making selections. Resume Timer - use this item to resume a paused timer. Stop Draft- use this item to completely halt the draft. This will stop the timer and prevent the next owner from making a selection. Start Draft - use this item turn back on a Stopped draft. This will reset the timer. (Clear) - click on this link to clear out the draft message history for all owners. Once cleared, this information cannot be restored. If someone (or the system) makes multiple picks that you'd like to "undo", you can do that by going to the For Commissioners > Setup > Revert Draft screen to "back up" your draft to any point in the past, and then continue drafting. Note that after doing a "Revert Draft", everyone in the league must refresh their entire live draft page to see the updated draft results. This is especially useful if several picks were made in error. See also item above (Undo Last Pick) to easily revert a single pick. In some cases it might be easier to just change a draft pick (ie, an owner made an obvious mistake). Use the For Commissioners > Setup > Change Draft Pick screen to adjust any single pick in the draft. These adjustments will include the text "Replacement pick made by Commissioner" in the comments column of the draft report. After doing a "Change Draft Pick", everyone in the live draft room mush refresh the live draft page to see the updated draft results. In this example a pick earlier in the draft the owner selected Glenn Gronkowski, instead of Rob Gronkowski. Since multiple picks have been made since then the commissioners best option is to use the Change Draft Pick screen to switch the two players. Sometimes, owners may have unanticipated computer problems, Internet connection problems, personal emergencies, etc. that cause the best laid plans to go to awry. Do you have a backup plan in place in case any unforeseen problems occur? If you have other problems that you can't immediately solve, please use the Help > Help Center option available from all league pages - that page goes over in detail all of the options you have available to you for getting further assistance for your draft problems. You can also click the Emergency Draft Help! link to submit a ticket to our support staff if an issue arises during your draft. In conclusion, we know that your live draft on the MyFantasyLeague.com site will be a great success, but to ensure it's success, you need to follow these important instructions above! While it's possible to run a live draft without the league commissioner present in the live draft room, we strongly recommend that a league commissioner be present at all times for a live draft. The "Commissioner Controls" mentioned above are essential for recovering from problems that might happen during the course of a live draft - without a commissioner present, no one will be able to pause the draft timer, undo draft picks, or any of the other sometimes necessary commissioner options mentioned above. This situation becomes extremely difficult to manage for deluxe leagues that hold multiple drafts at the same time. If the commissioner is unable to be in the live draft he can assign another owner commissioner access by going to the Setup > Grant Commissioner Access. If pick 1.01 has been pre-drafted, and the draft timer is on, the draft will start as soon as the Draft Start Time passes. However, if pick 1.01 has not been pre-drafted, then the timer does not actually start until the franchise owner of pick 1.01 actively makes his/her selection. This has been done to allow all owners extra time to get into the live draft. In some circumstances, all owners may have to use the "Refresh" button on their web browser to get an up-to-date live draft page. If any of the following events happens in your live draft, "Refreshing" your live draft page will bring it back up-to-date: Commissioner does a "Change Draft Pick", commissioner changes the draft timer length on the "Draft Timer Setup" page, or owners trade draft picks in the middle of a live draft (or, anything else along these lines that causes the draft order to change in the middle of a live draft). 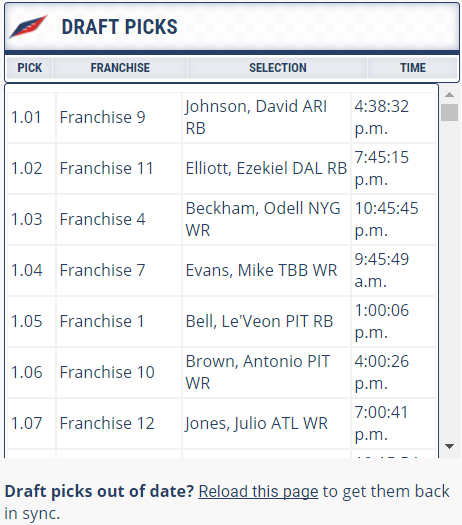 If there will be two different franchise owners at one computer during a live draft, you might be tempted to let each owner "take turns" at the computer, logging on and logging off of the site between picks. We strongly discourage you from taking this approach, as it will lead to a lot of confusion and delays in your draft. Instead, we recommend installing two different web browsers on the computer (Firefox - available at http://www.mozilla.org/products/firefox/ is an excellent web browser) - then, one owner can remain logged into the site using each browser, so they only need to take turns at the keyboard, and they will not continually log in and log out of the site when it's their turn to pick. If a majority of franchise owners are at one computer with a few located elsewhere - AND - an online MFL draft has been defined, have the commissioner login to make all the picks for the group of owners as the constant login-pick-logout for each team would be too cumbersome and interfere with your online draft. Here's a detailed scenario from a customer who reported unexpected live draft problems, even though they thought they had completely prepared for their live draft. In their testing of the live draft room, they did it with one laptop computer on a wireless network. When their real live draft started, there were many laptops on that same wireless network, which completely overwhelmed the network's bandwidth, effectively grinding their live draft to a halt. The solution to the problem? Only have one commissioner use his laptop for the live draft, entering everyone's picks as they happened if all logged into the same wireless network. Since the league chat feature is per league, and live drafts for deluxe leagues are per division or per conference, the chat module displayed in the live draft will display all league chat messages, and not just the chat messages associated with the current deluxe league division/conference draft, which might cause some confusion if multiple drafts for a deluxe league are happening at the same time. Note that the chat cannot be saved and is only intended for during draft trash talking. 7. 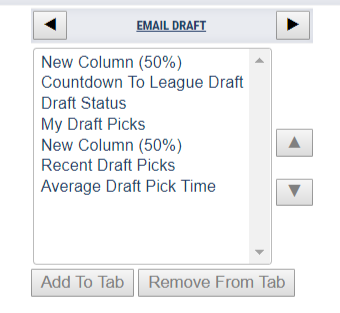 How do I conduct an Email Draft (long running draft) on MyFantasyLeague.com? Go to the For Commissioners > Setup > General League Setup screen to specify "Email Draft: On-line, long-running (email) draft, taking several days/weeks to complete." Use the For Commissioners > Setup > Draft Start Date/Time Setup screen to define the time in which your first draft pick *may* be made. You draft can, but does not have to start at this exact time. It cannot start before this time. NOTE: If you don't see the Draft Setup screens, you will have to go to For Commissioners > Setup > General League Setup screen to enable one of the 'online draft' settings. 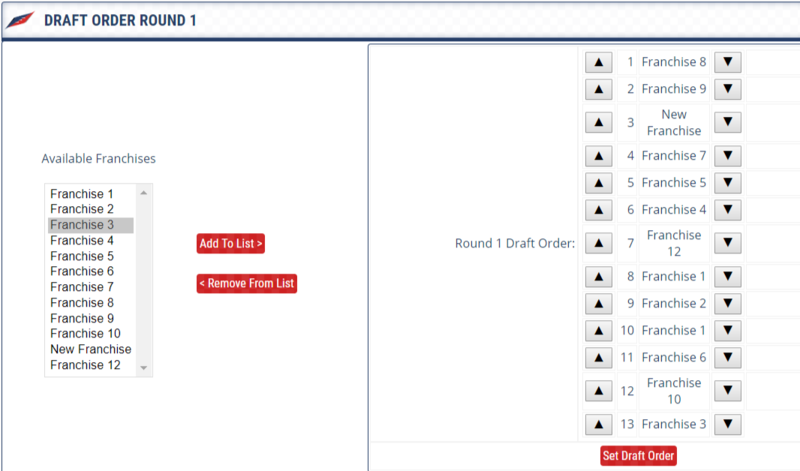 Define the overall draft order and round of your draft on the Setup > Draft Order Setup - All Rounds screen. Here you will set the Round 1 Order and enter the number of rounds for your draft. Note the default number of rounds for your draft is the Roster size. (Optional) Should you need to adjust additional rounds of your draft you can use the Setup > Set Draft Order Setup - One Round. Use this screen to manually adjust any rounds as needed. Then be sure to save the Draft Order for that round. You can then re-access the page to modify additional rounds. (for Upgraded Leagues) Should you allow the trading of draft picks each season you will need to import the traded picks from the prior year into your Draft once this is defined. Go to the Setup > Import Future Draft Picks. Finally, you will go to the For Commissioners > Setup > General Draft & Timer Setup screen. This screen will be used to define your timer parameters and what occurs when the timer expires. Begin by turning the timer on if you wish to run a timer or enable the option to have the timer on, but suspended during a specific set time each day. This only applies to Email Drafts and is typically used to suspend the timer at night. NOTE: The draft timer cannot be suspended overnight if it's set to more than 24 hours. Next set the length of time between picks. This is the amount of time that the owner will have on the clock to make their pick before the timer expires. NOTE: The time selected above is the minimum amount of time that the system will wait before expiring. For example, if you select 12 hours, the system will wait at least 12 hours, but no more than 12 hours and 15 minutes, before expiring. The system will check the status of the draft every 15 minutes, on the hour, at 15 minutes after the hour, half-past the hour, and 45 minutes after the hour, to see if the timer has expired. This ONLY applies to an Email Draft, not a Live Draft. When the Draft Timer Expires - The system will always first attempt to pick a player for the owner according to the owner's "Work List" in the Live Draft Room, and then the owner's "My Draft List." For an email draft, there is not a Live Draft Room in which owners would make their picks. The home page however will create a Tab titled "Email Draft". This tab will contain all relevant information for your draft. The draft will not begin until after the start date/time is set and the first pick has been made. The owner of pick 1.01 must either pre-draft their pick, in which case the clock will begin once the time has elapsed for the Draft Start as set on the League Calendar, or go to the For Owners > Draft to make their selection. Once the first pick is made the timer will begin as set on the Setup > General Draft & Timer Setup screen. Owners can view the picks on the Reports > League > Draft and view their rosters on the Reports > Franchise > Rosters. Owners prior to the draft can create a Draft List to be a reference list during the draft or to pick should the clock expire. This can be set up on the For Owners > My Draft List and corresponding For Owners > My Draft Preferences which can be used to auto-draft for your team. NOTE: Pre-draft picks are selected immediately when you are on the clock and intended only for missing the next pick. You will not wish to predraft multiple rounds, but instead use the My Draft List if you will be missing multiple rounds in a row. For details on how to enter both of these options see the Help Center - Owner Tutorials and view the FAQ's How do I create My Draft List and How do Pre-draft my Picks?. When it is an owners turn to make their selection they can either click the links provided on the Draft Status Home Page module, the Draft Report or go to the For Owners > Draft. Here they will select a player from the left hand column of Available Players. They can also choose to add comments to their pick. Once ready they can press the button "Draft Player". That player will then immediately be added to their team and their turn is over. At any time the commissioner can make a pick for an owner. This can be done by the commissioner going to the For Owners > Draft and selecting the franchise to make a selection for in the drop down box. Note: The commissioner lockout needs to be turned off. To turn off the autopick option as an owner you will simply need to pre-draft your next pick. If someone (or the system) makes a pick that you'd like to "undo", you can do that by going to the For Commissioners > Setup > Draft Setup > Revert Draft screen to "back up" your draft to any point in the past, and then continue drafting. This is especially useful if several picks were made in error. If you wish to fully restart the draft you will set it to revert to Round 1, Pick 1. In some cases it might be easier After doing a "Change Draft Pick", everyone in the live draft room mush refresh the live draft page to see the updated draft results. To just change a draft pick (ie, an owner made an obvious mistake), Use the For Commissioners > Setup > Change Draft Pick screen to adjust any single pick in the draft. When a pick just needs to be skipped for any reason, use the For Commissioners > Setup > Skip Draft Pick page. Skipped picks will include the text "Pick Skipped By Commissioner" in the comments column of the draft report. Draft Status Update - This will send an email to all owners with each draft pick made. When I'm On The Clock For My Draft - This will send an email when your franchise is on the clock in an email Draft. Draft Status Update - This will send a textl to all owners with each draft pick made. When I'm On The Clock For My Draft - This will send a text when your franchise is on the clock in an email Draft. Note: You must have your cell phone information set up and validate your cell phone in order to receive these. The draft is complete once the last pick has been made. All players are automatically added during the draft to the Report > Franchise > Rosters and can be viewed there. The final draft report can be viewed on the Reports > League > Draft. 8. How do I prepare for a Live Online Auction on MyFantasyLeague.com? So, you're considering running your "live auction" for drafting via the MyFantasyLeague.com web site? Great! Since your live auction is one of the most important parts of the season, it's essential that you do a little preparation for running your auction on-line, to make sure it goes as smoothly as possible. Therefore, we strongly encourage you read and understand ALL of the following potential "gotchas" related to running your live auction on the MyFantasyLeague.com site. First, determine if a MFL live on-line Auction is really what you want to do. We recommend live auctions on MyFantasyLeague.com only for leagues that want to conduct an auction all at once, where the owners are geographically separated (i.e., not all together in the same room). If all owners are together in one room, or, you'd like to conduct your auction in a more "slow" email-type fashion, we do not recommend the use of the on-line live auction feature. Go to your For Commissioners > Setup > General League Setup page to specify: Initial Rosters are Set by: "Live Auction: On-line, live auction that happens all at once, taking a matter of hours to complete." Use the For Commissioners > Setup > Auction Start Date/Time Setup screen to define the time in which your first bid may be made. Your auction can, but does not have to start at this exact time. It cannot start before this time. NOTE: If you don't see the Auction Setup screens, you will have to go to For Commissioners > Setup > General League Setup screen to enable one of the 'online auction' settings. On the Setup > General Auction Setup you will define the various settings for your league auction. Minimum Opening Bid - Define the smallest dollar amount necessary to allow a franchise to start a new player auction. All Bids Must Be In Increments Of - Specify the increment of each bid. Use a "1" increment to ensure only whole number bids. NOTE: Do not enter a dollar ($) sign for any amounts on this screen. Do Winning Auction Bids Amounts get Charged to an Owner's Accounting Report as "Real" Dollars? - Enable this option (default is disabled) to have a franchise's winning bid amount converted to a fee for that franchise to appear on the Accounting Report. Available Player Pool For This Auction - This allows you to limit your player pool to a Rookie Only or Veteran Only player pool during your auction. Should Owners be Forced to have a Full Roster at the End of the Auction? - Enable this setting (default is disabled) to require each franchise to save enough auction funds to ensure that they will be able to bid on players to generate a complete roster. Initial Live Auction Time Limit: - (For Live Auctions) Select the time limit for each player up for auction when the first bid is submitted. Live Auction Time Limit After Bid is Raised: Select the time limit for each player after the initial bid is made. This time is typically less than your initial live timer. Time Limit to Put a Player Up For Auction: - (For Live Auctions) Select the time allowed for the next franchise to put a player up for auction. Default is 60 seconds. Automatically Nominate A Player On Behalf Of Current Franchise If Nomination Timer Expired - Enable this option to have the system automatically nominate the next player based on the Average Auction Values (AAV) when the above timer expires. Automatically Rotate Nomination Process Between All Franchises - Enable this option to have a set order for your owners to nominate players in a live auction. NOTE: By default this is the Franchise Order, but can be customized on the Setup > Custom Franchise Order. Starting Auction Funds Available -Set the amount that each owner will begin their auction with. Same amount available to all franchises as set below. - This is the overall amount each team has to use to bid on all players. Each franchise has it's own amount as set below. - As opposed to the above 'To All Franchises' which requires all teams start with the same amount of money to use in their auction bidding, this option allow for each team to have a different amount. Set to each franchise current accounting balance. - Select this option to use the values in the Accounting Report as a starting balance for each franchise's auction amount. Available Auction Funds Are Reduced By - Set the amount that the available funds are reduced by during the auction as players are won. Currently underway auctions plus completed auctions - The default option takes into account all auctions. Currently underway auctions plus salary amount from current roster - Only for salary cap leagues, this setting uses current salary cap amount for all players on the owner's roster. This option will be useful for leagues who want to first do a "load rosters" for loading partial results before having their auction on-line, or want post-auction trades to update the available funds for each franchise. Currently underway auctions only - This option will be useful in conjunction with the 'Based on each franchise's current accounting balance' setting above. NOTE: By default, salary-cap-enabled leagues using a preseason auction will automatically have the winning auction bid defined as the value each player's initial salary. This is probably the most important step of all - ALL owners need to at least experiment with the live auction pages a little bit before the start of your live auction to make sure that they don't have any problems accessing those pages and get a general feel for how things work before your auction actually starts. Otherwise, you may well spend the first half-hour or more of your auction just making sure everyone is logged on properly, and understand what they need to do on the site. This also confirms all browser and compatibility issues for computers and mobile devices prior to the day of the auction. So your auction is finally here. You have set up all the parameters as described above and your owners have accessed the live auction room from their computer or mobile device prior to the start of the auction to get a feel. Start by making sure all owners have accessed the Live Auction Room which can be accessed through the For Owners > Live Auction Room. You can verify their status in the "Live Chat" to ensure they are ready to begin. The first owner will select a player and enter the bid value in the Nominate a Player Module and press the “Nominate” button. NOTE: The commissioner must enable owners abilities to nominate players on the Setup > Abilities Setup in order for the owners to begin a player. Owners can use the “My Work List” to organize the players they wish to nominate at their turn. If your league rotates the nomination order then the order for nominating will be displayed under the “Auction Status” module. The player up for nomination will appear in this module with the current High Bid and High Bidder. Owners can then enter a bid value in the free form box and press the “Make Bid” button, or press the “Bid+#” button to increase the bid by the minimum incremented bid amount. When highlighting a player you can view the player Profile at the bottom left of the screen. This module will display various notes throughout the auction, such as paused timers, deleted auctions, auto-nominating due to timer expiring, etc. This helps track various functions during the auction. This is used to chat (or trash talk) with the other owners in your live auction room. NOTE: These messages are not saved. This is only used during the auction and will display up to 40 messages in the Communications > League Chat. There is not an option to maintain a history of this chat. As players are won the Auction Status will update each owners available funds and players on rosters. This module is also used to track the nomination order for the Auction if your league chooses to “Automatically Rotate Nomination Process Between All Franchises” on the General Auction Setup screen. NOTE: The commissioner can use the "Skip Current Nominator" button at any time during the Auction to skip an owner. The nomination order can be changed by going to the Setup > Custom Franchise Order. NOTE: If your league does not force owners to have full rosters at the end of your auction, the 'Max' column is just a guideline, and not a system-enforced requirement. This module will display your entire roster for your franchise as well as the league Roster Requirements. Finally, understand what to do in case of unexpected problems during your live auction. For an important real-time event like a live auction, if things go wrong, they can snowball in a hurry. You need to be sure that even after you've done all of the above important steps, you consider the following. Pause Auction - use this to suspend the timer between auctions - for example, if you want to take a mid-auction break. It does not pause any players currently up for auction. Skip Current Nominator – Use this item to skip the current owner up to nominate the next player. If someone starts a player or bids on an auction that you wish to undo, you can do that by going to the For Commissioners > Setup > Delete Auction to clear the Auction. NOTE: There is not an option to undo an individual bid. You would need to delete the entire auction and can then re-nominate the player for an owner. Be sure to refresh your auction page to update the player list when deleting an auction. If you have other problems that you can't immediately solve, please use the Help > Help Center option available from all league pages - that page goes over in detail all of the options you have available to you for getting further assistance for your auction problems. You can also click the Emergency Auction Help! link to submit a ticket to our support staff if an issue arises during your draft. In conclusion, we know that your live auction on the MyFantasyLeague.com site will be a great success, but to ensure it's success, you need to follow these important instructions above! While it's possible to run a live auction without the league commissioner present in the live auction room, we strongly recommend that a league commissioner be present at all times for a live auction. The "Commissioner Controls" mentioned above are essential for recovering from problems that might happen during the course of a live auction - without a commissioner present, no one will be able to pause the auction timer, delete auctions, or any of the other sometimes necessary commissioner options mentioned above. The Auction Messages will display to the league what is occurring during the auction and useful if owners try to nominate out of turn or the auction timer is paused. In some circumstances, all owners may have to use the "Refresh" button on their web browser to get an up-to-date live auction page. If any of the following events happens in your live auction, "Refreshing" your live auction page will bring it back up-to-date: commissioner changes the auction timer length on the "General Auction Setup" page, (or, anything else along these lines that causes the setup to change during the Live Auction). If there will be two different franchise owners at one computer during a live auction, you might be tempted to let each owner "take turns" at the computer, logging on and logging off of the site between picks. We strongly discourage you from taking this approach, as it will lead to a lot of confusion and delays in your auction. Instead, we recommend installing two different web browsers on the computer (Firefox - available at http://www.mozilla.org/products/firefox/ is an excellent web browser) - then, one owner can remain logged into the site using each browser, so they only need to take turns at the keyboard, and they will not continually log in and log out of the site when it's their turn to pick. Here's a detailed scenario from a customer who reported unexpected live auction problems, even though they thought they had completely prepared. In their testing of the live auction room, they did it with one laptop computer on a wireless network. When their real live auction started, there were many laptops on that same wireless network, which completely overwhelmed the network's bandwidth, effectively grinding their live auction to a halt. The solution to the problem? If all owners are at one location bidding on players have the commissioner enter the final winning bid for the owner in the Live Auction Room to assign that player to their roster and deduct their funds. 9. How do I conduct an Email Auction (Long Running) on MyFantasyLeague.com? Go to the For Commissioners > Setup > General League Setup screen to specify "Email Auction: On-line, long-running auction, taking several days/weeks to complete." Maximum Number of Players That Can Be Up For Auction At One Time? - Adjust this setting (default is unlimited) to limit the number of players nominated at one time in a auction. Yes, but on Nominations Only - Enable this option to allow comments when owners first nominate a player. Yes, on Nominations & Bid Increases - Enable this option to allow comments on all bids. On the Setup > General Auction Setup you will define the timer parameters for your auction. High Bid Changed - this option allows the auction to continue as long as a new bid has been made (including an updated proxy bid). Once all bids have ceased, the timer must count down before the corresponding auction is closed. High Bidder Changed - this option can be used for leagues that have proxy auctions, do not want the auction clock reset when an owner's bid causes the high bid on a player to increase, but the bid is not big enough to exceed the current proxy amount for that player. Auction Started - this option allows a finite time for an auction regardless of the number or frequency of the bids. Once an auction has been started, it will end as soon as the time runs out. NOTE: Since this option technically could allow your auction to continue into the season, the only way to ultimately end the auction process is to change the General League Setup screen option from 'Online Auction' to 'Load Rosters'. Use Proxy Bidding - Enable this option to allow for proxy (eBay) style bidding for all of your preseason auction bids. The default option of "No" means that bids will be treated the same way they were before the introduction of this option. This only applies to Email Auctions. Yes, enforcing is Private - The transaction will display the new increased bid, but not reveal which owner caused the increase. Yes, enforcing is Public - The transaction will display both the increased bid and the owner which raised the bid to increase the proxy. No - Proxy Bids are not used. Let's assume that Franchise 1 opens bidding on Player A, and the initial bid is $5.00. The system will "remember" the maximum bid of $5.00, and report the initial bid on this player equal to the "Minimum Opening Bid" of $1.00. Then, Franchise 2 submits a bid of $2.00 on Player A. The system recognizes that Franchise 1 was willing to pay up to $5.00 for Player A, so immediately after Franchise 2 submits his $2.00 bid, the system notifies him that he has been outbid, and then considers the high bid on Player A to be $2.00. Then, Franchise 2 submits a bid of $5.00 on Player A. The system recognizes that this bid amount is equal to the maximum bid made by Franchise 1, so the system then considers Franchise 2 to be immediately out-bid (earlier bids always beat later bids of the same amount), but the system then considers the current bid amount for Player A to be $5.00 (the maximum amount that Franchise 1 was willing to bid). In other words, this "proxy" bidding configuration allows a franchise owner to bid only as much as he needs to on any given player, and no more. Owners will go to the For Owners > Auction Bid room to begin nominating players. Here the owners can select a player to nominate and enter the initial value. Once a player is nominated, owners can go to the For Owners > Auction Bid to submit bids on players. Winning bids will automatically update the teams rosters and all winning bids can be viewed under the Reports > League > Auction Results. There is not an option to delete an individual bid. However the commissioner can delete an auction at any point in time by going to the Setup > Delete Auctions. Here you will check the "Delete" box next to the auction you wish to remove. Next, choose "Drop Players From Rosters In The Case Of Completed Auctions?" to either keep the player or remove the player from the roster. NOTE: if an owner makes a bid by mistake the commissioner can delete the current auction for the player. Then go to the For Owners > Auction Bid page and re-submit the bid for the owner. Auction Update - This will send an email to all owners with each new nominated player and bid. Auction Update - This will send a text to all owners with each new nominated player and bid. When all players have been awarded, and your league wishes to end the auction the commissioner will go to the For Owners > Auction Bid and at the bottom of his screen select “End the Auction”. NOTE: All current open auctions will be discarded and the players involved will be returned to the free agent pool and franchise owners will not be able to bid on players. 10. How do I setup my Add/Drops on MyFantasyLeague.com? In order to allow your owners to pick up (waivers) players, you must have the For Commissioners > Setup > Abilities Setup screen defined to allow at least one franchise the ability to 'Perform Add/Drops'. NOTE: Un-checking these options will prevent owners from using the Add/Drop to acquire players. Go to the Setup > General Add/Drop Setup screen to enable your settings to acquire players. If you wish to overwrite your waivers that you have defined to process on the Calendar or wish to define your seasonal waivers then choose to Delete them. If you are adjusting additional settings and do not wish to alter your calendar then select "Keep them as they are". What Type of Add/Drop System Does your League Use - Specify the type of add/drops you wish to run weekly. See the examples below for details. Always First Come, First Served - Players are never locked (on waivers) and all players are simply FA. They are acquired on a FCFS basis at all times. Always via Waiver Request - All Free Agents are considered locked (on waivers) at all times and can only be acquired through waiver request, which will process at specific times each week. Waiver Request for Locked Players, First Come/First Served for Rest - This option allows for a league to lock all players at the start of the week and require them to go through a waiver request period. These players then process and all players are then FA and available on a FCFS basis. Always via Blind Bid Request - All Free Agents are considered locked (on waivers) at all times and can only be acquired through blind bid request, which will process at specific times each week. Blind Bidding for Locked Players, First Come/First Served for Rest - This option allows for a league to lock all players at the start of the week and require them to go through a blind bid request period. These players then process and all players are then FA and available on a FCFS basis. None of the Above - This option is used if you want the commissioner to make all the moves or you play in a draft-only league. Do You Want to Process Waivers Automatically? - Enable this option to use the Add/Drop Setup and have the system automatically process your waivers for locked players at the end of each specified time. The system will award the locked players based on the waiver criteria you have defined. NOTE: If this option is turned off (No, the commissioner will process them manually), then event times are not defined and the commissioner can go to the For Commissioner > Manually Process Waivers to process these requests at their desired time. What Days Do You Want Automated Waiver Process to Run? - Check the corresponding boxes to have the waivers for locked players run on these days each week. NOTE: Waivers will not process by the system on Sundays from 12:00pm ET until 11:59pm ET due to games. What Time Do You Want Automated Waiver Process to Run? - Set the time in which you wish to have the waivers for locked players run based on the dates selected. Dropped Players Are Locked Until: Choose how players that are dropped in a resulting add/drop move are handled for your league. Players are not locked when dropped. They can be immediately picked up (subject to leagues waiver rules). This allows players to be immediately acquired via Add/Drop (when waiver events are not defined) when they are dropped from a Roster. X day(s) later - This option locks a player that is dropped for a specific amount of time. Example: Locked for 1 day. If this is enabled and a player is dropped at 3pm Wednesday they are locked until 3pm Thursday. Until [Day], [Time] -- This option locks a dropped player until a specific day/time each week. Use this option if you wish to lock a player from being acquired for the remainder of the week. Example: Locked until: Monday at 9pm ET. This would lock a player that is dropped on Wednesday at 3pm until the following week Monday at 9pm, where they could not be acquired via FCFS for that week. They would then be part of the add/drop rules for the following week. The first waivers run after X days - This option is designed for leagues that run waivers daily. If a player is dropped, they can then go through the subsequent waiver period to be awarded. Example: Locked Until - The first waivers run after 1 day. Your league is set up to run waivers daily at 10pm. A player is dropped on Wednesday at 3pm and will therefore be locked until the following Thursday's waiver period at 10pm. Lock All Free Agents Each Week On - Set a specific date/time to lock the FA's each week. This is used typically to lock all players at the start of a week to then have them go on waivers. Example: Lock All Free Agents Each Week: Sun @ 1pm. With this option set it will lock players from FCFS moves starting Sunday’s at 1pm. All players would then be subject to being claimed via waivers (waiver request or blind bidding) as set on the Setup > General Add/Drop Setup. Prevent Owners From Making ANY Roster Moves After Kickoff Of That Player's Game Until The End Of The Week?- Enable this option to disallow owners from making any FCFS Free Agent moves between kickoff of each player's game through the end of the last game of the week (usually the MNF game). This will also prevent the processing of any waiver request or blind bid waiver move of a player whose game has already kicked off as well as any Injured Reserve or Taxi move. Don't Allow Add/Drops After Season Ends Starting On: - Set the date/time in which you no longer wish to allow add/drops for players at the end of your season. Go to the Setup > Waivers/FA Setup screen to define additional parameters for your add/drops and waivers. X players per season via add/drop - Enter an integer value here to restrict the number of total moves any franchise can make (via the For Owners >Add/Drop screen) in a single fantasy season. X players per week via waivers- Enter an integer value here to restrict the number of waiver moves (Waiver Request or Blind Bidding) for locked players any franchise can make in a single fantasy waiver week (as specified below) via the For Owners > Add/Drop screen. For purposes of the above weekly transaction limits, a week starts at: - Set the time in which your weekly waiver week will begin for the purpose of limiting waiver moves. NOTE: Default is Sunday at 1pm. If you allow moves until Kickoff Of the individual players game (such as Monday night) then set this to Monday at 9pm ET. NOTE: The system does not track "weeks" until kickoff. Any move made prior to kickoff of Week 1 is considered a "Week 1 waiver move". Therefore you will not want to use this option in the offseason. Prevent Rookie Players from being acquired via Waivers - Enable this option to disallow owners from acquiring rookies. This feature is designed for leagues that hold a specific rookie draft and do not wish to have the rookies acquired via FCFS or Waivers prior to this draft (typically dynasty leagues). NOTE: If you enable this option for your league and wish to hold a rookie draft or Auction you will need to turn it off in order to be able to have the rookies appear in the draft list. Once a player is acquired, he cannot be dropped for this many days - Enable this option to require a player to remain on a roster for a minimum number of days before being allowed to be dropped by that franchise. Use the Setup > Waiver Request Setup screen to define the parameters of your waiver requests for locked players. NOTE: This option requires that "Waiver Request" is enabled as the type of Add/Drop System used on the General Add/Drop Setup screen. Max. Rounds for the Weekly Waiver Wire - Each waiver request period may have up to eight rounds (this does not apply to the other types of waiver defined above). Each franchise may select waiver requests for as many rounds as defined by the league. When the waiver requests are processed, each franchise will only receive one player per waiver round before any franchise will receive two players. When set to the maximum of eight rounds, a franchise could at most add/drop up to eight players in one waiver round. Every round is same order, using the criteria below. - This default setting will keep waivers consistent from round to round. The order will always process 1-N for each round of your waivers as set by the waiver sort order below, or via the Custom Waiver Order. The first round of every waiver run is set using the criteria below, each subsequent round is the reverse order of the previous round. - This setting will provide a more balanced (snake-type) waiver award period. The order will process 1-N, N-1, 1-N. 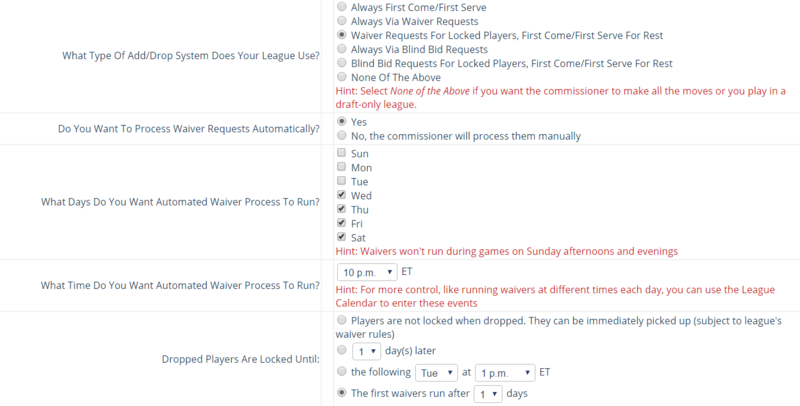 The system maintains a week-long rolling waiver order, moving the franchise that picks to the bottom of the list, but reseting when the standings are updated each week to the order using the criteria below - The initial order each week after Final MNF results run will be based on the sorting criteria set below. Then as waivers are awarded the franchise awarded a player moves to the bottom of the priority list throughout the week. The system maintains a season-long rolling waiver order, moving the franchise that picks to the bottom of the list. - This option offers a single waiver order whereby any time an owner is awarded a player, they automatically drop to the bottom of the waiver priority list. Example: The initial order is A, B, C, D E.
In Round 1 A, C and E all are awarded players. The resulting order is: B, D, A, C, E.
In Round 2 A and E all are awarded players. The resulting order is: B, D, C, A, E.
NOTE: When using the "season-long rolling order" option, all other waiver criteria remain unused. Waiver Sort Criteria - Define the order of the sort criteria to be used in calculating the weekly standings. Waivers are awarded Worst to First. The resulting order can be viewed on the Reports > Standings > < a target="_blank" href="http://www03.myfantasyleague.com/2019/options?L=league_id&O=119&TYPE=WAIVERS"> Tiebreaker - Waivers. Overall Winning Percentage - This is the most common primary sort criteria that uses wins & losses. Head-to-Head Record - This cannot be used as a primary sort criteria as it only compares the H2H matchups of two teams individually. Total Points Scored - For Total Points (non Head-to-Head) leagues, this selection sorts by year-to-date fantasy points. Reverse Order of Opponents Total Points Scored - This option awards a higher ranking to teams who's opponents have scored fewer points. This too should never be used as a primary sort. Conference Winning Percentage - Same as Overall Winning %, but restricts sort to teams in each conference. Divisional Winning Percentage - Same as Overall Winning %, but restricts sort to teams in each division. Custom 1. - Defined using the Standings Setup screen. Reverse of Custom 1 -Opposite order of Custom 1 above. Victory Points - This option awards based on Victory Points if used for a league. Last Week's Point Total - To allow commissioners to sort the league standings report based on the franchise score of the most recently completed week of the season. All Play Winning Percent - Uses the All Play Record to sort. Total Offensive Points - Sorts by the total points scored by the offensive players on a franchise. Total Defensive Points - Sorts by the total points scored by the defensive players or Def on a franchise. NOTE: If a Custom order is defined on the Setup > Custom Waiver Order Setup screen, or the option for a Season Long Rolling Waiver Order is selected then the above criteria is not used when processing. Go to the Setup > Blind Bidding Waivers Setup to define the parameters of your blind bidding waivers for locked players. NOTE: This option requires that "Blind Bidding Waivers" is enabled as the type of Add/Drop System used on the General Add/Drop Setup screen. Salary Cap Dollars And Blind Bidding Dollars Treated As One And The Same - This option is only available if the league has enabled the use of salary cap support on the General League Setup page. When set to 'Yes', a winning blind bid amount populates the player's current salary. This will also prevent the commissioner from entering various fields on this setup page, as the blind bidding amount is programmatically determined based on values define on the Salary Cap Setup . Do Winning Blind Bid Waiver Amounts Get Assigned As Player Salaries? Turning this option on causes the system to assign blind bid amounts as player salaries. This feature automatically is enabled if the option to treat Salary Cap Dollars and Blind Bidding Dollars the same is enabled. Amount Each Owner Can Spend During The Season On Blind Bid Waivers: - Enter the overall amount each owner may spend on blind bidding waivers throughout the season. Do not include special characters (ie, "$" and ","). NOTE: This feature does not apply to leagues who use Salary Cap Dollars and Blind Bidding Dollars Treated as One and the Same. Blind Bids Must Be In Increments Of - Enter a value in this field to define a minimum raise in order for one franchise to outbid another. For example, if you enter "1" and the current bid on a player is "5", a new bid of at least "6" is required to outbid the current bid. Minimum Blind Bid Amount - Specify a value here to create a floor (lowest amount) for all initial bids. Amount charged for player acquired via FCFS waivers - Specify a value here to have this amount charged to an owners blind bidding balance when making a First Come, First Served FA move. NOTE: This feature does not apply when using the option to have Salary Cap Dollars treated as Blind Bidding Dollars. If you wish to have FA’s charged against the cap (available funds) you will set the default for Free Agents on the Setup > Enter Players Salaries/Contracts. Allow Conditional Blind Bids? -Enable this option to allow conditional blind bidding. ; See the General Add/Drop FA and Waivers Tutorial for details. NOTE: Do not change this setting if you have any pending blind bids. First go to the Process Waivers screen to process the pending bids and then change this setting as needed. Maximum Number of Conditional Groups Allowed - This is the number of permitted groups a franchise can submit in a week for conditional bidding. Winning Bids Charge As 'Real Dollars' - For all winning blind bids, convert the amount to a corresponding amount in the league's accounting to appear on the Reports > Franchise > Accounting. Adjust Individual Franchise Blind Bid Balances: - . Check this box to display all franchises and their current blind bid balance to date. The commissioner can add an optional adjustment to this value to increase/decrease the available funds to a franchise. Carry Blind Bid Balances to Next Year When Upgrading League? - . Enable this option to have the remaining balances carried to the following season when upgrading. How Long Since Franchise Won a Bid - Select this setting to have the team that has not won a bid in the longest amount of time be awarded a bid in the event of a tie. Earliest Submitted Bid Wins - Specify this setting to give priority to the owner that submitted a tied bid first. Using Sort Criteria Listed Below - Select this option and then specify the order of any sort criteria to be used to break any blind bidding ties. All sort criteria are used in a worst-to-first manner. NOTE: Add the Balance Available To Spend On Blind Bidding or Total Amount Spent YTD On Blind Bidding columns to the league standings report by going to the Standings Setup . If your league uses an alternate method for determining your waiver wire order, but still wish to have the waivers automatically process, you can define the Custom Waiver Order found in the For Commissioner > Setup > Custom Waiver Order Setup screen. Here you can set the custom order and this order will over-ride any other waiver sorting criteria. Hint: For preseason waivers and waivers that allow season long rolling waivers you will want to use this to define your initial waiver order. For preseason waivers you will want to delete this custom order after week 1's games are complete to default to your sorting criteria as defined on the Setup > Waiver Request Setup or Setup > Blind Bidding Setup. For the Season Long Rolling waivers you will not remove this custom order as this is the basis for your rolling order that the system will use when processing. You can view the resulting order on the Reports > Standings > Tiebreakers - Waivers or on the Previously Processed Waivers Report. 11. Can I see specific examples on how to setup my Add/Drops on MFL? Below are some examples of how to set up your add/drops on MFL. Note that you will want to first go to the Setup > General Add/Drop Setup page in order to define your seasonal events. NOTE: You will need to set your seasonal events prior to defining any offseason/preseason moves. Should you just run add/drops during the season you will simply select the parameters on this page and be all set! First Come, First Served moves for all players, no players on waivers throughout the week. Dropped Players are Locked Until: Here you can choose to lock players from being acquired immediately. Waiver Request or Blind Bidding for all players starting at Sunday's Kickoff and processing on Wednesday night at 10 pm ET, followed by First Come, First Served for all players. Dropped players are not locked and immediately available for FCFS. NOTE: To allow FCFS moves until players individual gametime you will change the “Lock all FA Each Week on” to read Mon @ 9pm ET. Next set up the Waiver Request criteria on the Setup > Waiver Request Setup screen or the parameters for Blind Bidding on the Setup Blind Bidding Waivers Setup. You can also go to the Setup > Waivers/FA Setup screen to define additional limitations. Waiver Request or Blind Bidding for all players starting after Kickoff the MNF game until Wednesday at 10pm, followed by First Come, First Served for all players. Players that are dropped are locked for 1 day and go on waivers, which will process nightly at 10pm. What days do you want Waivers to Run? : Wednesday, Thursday, Friday, Saturday. Dropped Players are Locked Until: The first waivers run after 1 day. A player that is dropped on Thursday at 3 pm ET will be locked and on waivers for 1 day where he can be requested and is awarded when waivers run at 10pm on Friday. Daily Waivers (Waiver Request or Blind Bidding) where no FA (First Come, First Served Moves) allowed. Waivers process nightly at 3am for all players. Players that are dropped will be subject to 1 day on waivers before being acquired. NOTE: You will want to set the option for Dropped Players are Locked Until: The first waivers run after 1 day to avoid collusion. By setting a day in which players are required to wait one waiver period it allows other owners to request that player. It also prevents an owner from dropping a player at 2:55am and another submitting a request to be awarded at 3am. Daily Waivers (Waiver Request or Blind Bidding) processing Wednesday thru Saturday follwed by FA moves prior to gametime (First Come, First Served Moves) allowed. Waivers process nightly at 10pm for all players. Next, you will need to add additional events to the league calendar to re-lock the players daily so that they are on waivers and not available on a FCFS basis until after the final processing. Finally, set up the Waiver Request criteria on the Setup > Waiver Request Setup screen or the parameters for Blind Bidding on the Setup Blind Bidding Waivers Setup. You can also go to the Setup > Waivers/FA Setup screen to define additional limitations. This will have All players on waivers starting kickoff of their individual game and these players will process nightly starting Wed @ 10pm through Saturday at 10pm. Following this Saturday process all players are available on a FCFS basis until kickoff of their game. 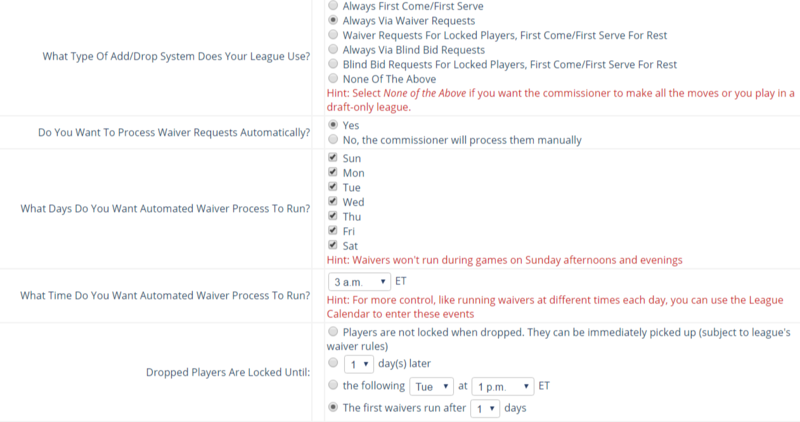 The Commissioner will Manually Process Waivers (Waiver Request or Blind Bidding), followed by FCFS moves until the players kickoff of their game. Next, you will need to add an event to your calendar when waivers cannot be submitted and allow time for the commissioner to process these before FCFS begins. NOTE: As soon as the commissioner processes waivers all players are unlocked and available on a FCFS basis. Therefore a "No Add/Drop" event is needed for a fair time for FCFS to begin. This will have All players on waivers starting kickoff of their individual game until Wed at 8pm. The commissioner can then go to the For Commissioner > Process Waivers between 8pm and 9pm on Wednesday and process these requests. Prior to setting up your offseason waivers you will need to define your seasonal waivers on the Setup > General Add/Drop Setup. Once that is done you can use the Setup Transaction Calendar Setup to define your offseason events. Define a (1) time waiver event immediately following the draft for all players that are locked, followed by FCFS until the seasons waivers begin. Set up your events for your seasonal waivers first. Based off of this you will then define the following events for your 1 time waiver period. On the Setup > Transaction Calendar Setup you have a draft currently and need to define parameters to lock all of your players. When the players are locked they will then go on Waivers. Owners can request these players and they will process at the defined time set on the calendar. Draft August 26, 2017 at 5:00pm. All Players will lock at the draft and owners can begin requesting these players. The locked players will process via waivers on Aug 28 and be awarded. They will then remain as FA on a FCFS basis until the seasonal waivers begin. Waivers from Sunday @ 1pm until Wednesday @ 10pm, followed by FCFS until Sunday. This runs all season and preseason (starting June 4): Dropped players are not locked. Dropped Players are Locked Until: Dropped players are not locked. 12. How do the new Add/Drops and Waivers work for MyFantasyLeague.com. 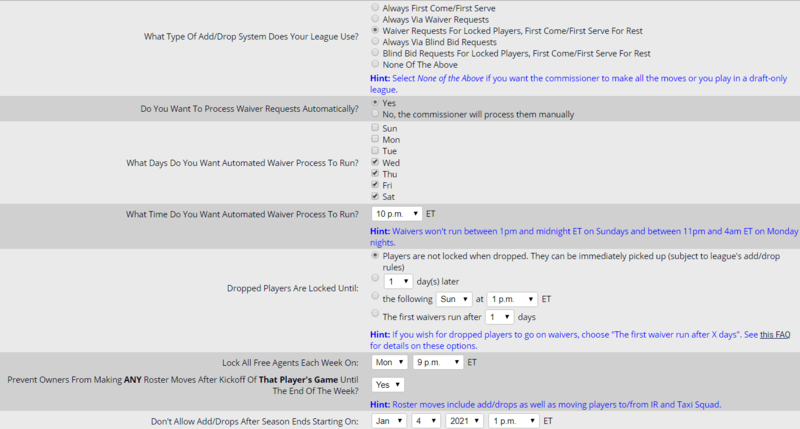 Overview of Add/Drops and Waivers for MyFantasyLeague.com. MyFantasyLeague.com has designed their Add/Drop settings to simulate that of the NFL. All players that are not currently on a roster would be available on a First Come, First Served Basis at all times, unless they are "locked", in which case they would go on Waivers (see the following for waiver types). Locked Players will appear with an * by their name on the add/drop lists. FREE AGENTS: Players that are not currently on a Roster or Locked are considered FA. They can be available at any time on a First Come, First Served Basis on the For Owners > Add/Drops screen. LOCKED PLAYERS: There are several options to locking a player. Locking Players at Kickoff Of their Game - ! Locking Players at Kickoff Of their Game - On the Setup > General Add/Drop Setup you can enable the option to "Prevent Owners From Making ANY Roster Moves After Kickoff Of That Player's Game Until The End Of The Week?". This is a default on MFL, which will not allow players to be added via FCFS once their game has kicked off, or be awarded in a Waiver move if their game has kicked off. It does "Lock" this player and allow them to now be requested via waiver request/blind bidding if enabled on your General Add/Drop Setup. NOTE: This was used on MFL leagues previously, but there was not an option to submit requests for that player until all players were set to start the waiver event. With this setting, if your league uses Waiver Request or Blind Bidding at the start of the following week then you can begin requesting the player as soon as their game kicks off. Locking Players that are Recently Dropped - On the Setup > General Add/Drop Setup screen there are (3) options to locking a player that is dropped. NOTE: This feature was used previously on MFL for leagues that chose to separate waivers (dropped players) and FA. Also known as Yahoo waivers on the site packages. Using this option now allows you to have waivers on dropped players (either via request or blind bid) and they will process daily if selected. Lock All Free Agents Each Week On - On the Setup > General Add/Drop Setup you can set a specific date/time to lock the FA's. This is used typically to lock all players at the start of a week to then have them go on waivers. Example: Lock All Free Agents Each Week: Sun @ 1pm. With this option set it will lock players from FCFS moves starting Sunday's at 1pm. All players would then be subject to being claimed via waivers (waiver request or blind bidding) as set on the Setup > General Add/Drop Setup screen. There are two options in which you can place claims on players that are locked (on waivers). Players can be claimed by Waiver Request or by Blind Bidding. Waiver Request This method allows a league to submit a request for a player which will be granted at a later date based on specified criteria. This time period may be for a specific day in the week or run nightly. In either case, the owner will submit a request for a "locked" player (see above how to lock the player for the week). At the end of the period the waivers will be awarded based on criteria specified (such as worst to first). Example: All players lock on Sunday at 1pm ET. The waivers are then set to process at 10pm on Tuesday. From Sunday until Tuesday night all owners can submit requests for players. These requests then process on Tuesday night and are independent of the time submitted. If the criteria used for determining the winner is based on Win/Loss record then the owner with the worst record would be awarded a player first. To continue operating as fairly as possible, the waiver request model only allows each franchise the ability to acquire a single player at a time. As a result, all teams that request a unique player will receive one player before any franchise receives a second player. The term 'waiver round' is used to specify the period whereby each franchise gets a single waiver request. Since it's quite reasonable, however, that a franchise would desire more than one waiver in a given week, the commissioner can define up to eight waiver rounds. This will limit a franchise from picking up a maximum of eight new players in a given waiver window. Blind Bidding - This waiver type allows for each owner to place a hidden bid for players. Typically a fixed amount is given to each franchise with which to use for all bids during the season. Franchises may only spend these bidding dollars on free agents. Once the waiver period has ended, the franchise with the highest bid will be awarded the player for the amount bid. There are two types of Blind Bidding available: Non-Conditional (default) and Conditional Bidding. Non-Conditional Bidding This option allows owners to enter a bid for all locked players that they wish into one bid group. The system will then process these bids and players will be awarded based on the highest bid. There is no priority in this type of bidding. Conditional Bidding This type of bidding allows owners to submit bids into multiple groups and prioritize their picks in each group Each group is reviewed in order, top to bottom, and when the highest bid in that group is valid it will be accepted, thus ignoring all other bids as they are "conditions"of the higher priority in that specific group. Groups do not have any priority over each other, these merely act as placeholders for additional bids. See our Blind Bidding FAQ - How do I Enter Blind Bids for a detailed example. 13. How do I set up my league's scoring system? Use one of the many 'standard' scoring rule sets that have been defined. Go to the For Commissioners > Setup > Select A Packaged Scoring System screen and select one of the pre-packaged scoring systems. Copy a league scoring system from another league on the For Commissioners > Setup > Select A Packaged Scoring System screen and entering the year and 5-digit League ID. NOTE: With any of the options above you can always go to the Reports > Rules > League Scoring to Edit the individual rules as needed for your league. To see all available scoring rules and positions you can see this document. To find a full list please visit our supported scoring rules page. If you'd like a hand with setting up your league scoring system, we're here to help!. To set up your scoring rules on MFL you can either set them up from scratch on the For Commissioners > Setup > Custom Scoring Setup or first choose one of the packaged scoring options and the modify/add/remove rules as needed. Prior to setting up your rules you will need to select your positions that you wish to use on the Setup > Starting Lineup Setup screen. Next, go to the Setup > Select A Packaged Scoring System to choose a packaged set of rules for your league. Now view your rules on the Reports > Rules > League Scoring. When logged in as commissioner you will see the option to "Edit" or "Test" your rules. Selecting "Test" will open a pop-up that will display all points with the specific ranges defined. If you choose to "Edit" the rules you can edit the ranges/points in that specific rule. On the Scoring Rules if you choose to (Edit) any position or rule you are taken to the Setup > Custom Scoring Setup screen. Highlight the rule in the “Available scoring rules” in the left hand column and click the button"Add to List". On this screen you can also remove any scoring rule that you do not wish to apply to your players. Now set the ranges and points you wish to award. NOTE: The ranges will always run Low to High, so if you wish to award for negative yardage you would set it -99 as the range low to -1 as the range high. Conditional Scoring – this will allow you to require a minimum value before a player is awarded points. Such as 1 point for every 10 Rushing Yards with a minimum of 5 Rushing attempts. When you enter ranges you will only score points in those ranges. These rules can be defined in the Setup > Custom Scoring Setup. The bonus scores would be in addition to your regular ranges for scoring rules. By defining the above bonuses it will account for all previous points. Note you must check the box for Formula Scoring. When adding rules you will need to ensure all ranges are covered. Points will only be awarded in that range. You can verify on the Reports > Rules > League Scoring that all ranges are covered as a warning will appear when there is a missing value. If using the "Points for every" it will being at 1 for your range. If you wish to start at a minimum value you will need to use the formula scoring to set your starting value. All Percentage and Average rules require decimal places when setting up the ranges, otherwise there are "holes" between the rules that will prevent them from calculating. Ranges need to be defined as 0.00-9.99, 10.00-19.99, 20.00-29.99, etc. If using decimal scoring you will need to set the number of decimal places on the Setup > General Scoring Setup. Additionally your rules will need to be defined to account for decimals, such as: 0.1 points per yard instead of 1 pt for every 10 yards. Adjusting rules during the season. If you make changes after final stats have run you will need to go to the home page to apply these scoring rule changes. Note that if you choose to have stats changes, these are applied on Thursday and will then automatically apply any scoring rule changes you have made. On the Setup > General Scoring Setup you can define additional parameters for your scoring rules and scoring settings. Calculate Fantasy Results Starting on Week - Define the NFL week in which your fantasy season starts (typically week 1). NOTE: For NFL Playoff Leagues this will default to week 18. Calculate Fantasy Results Ending on Week - Define the NFL week in which your fantasy season ends. Weekly results for your league will only be computed through the week number define here, so this includes your Fantasy Playoffs. NOTE: For NFL Playoff Leagues this will default to week 21. Number of Decimal Places For League Scoring - If your league uses decimal scoring for your league rules, you still must define the number of decimal placed (0-3) in which to calculate your fantasy point scores. Use 1 place for tenths of a point, 2 places for hundredths of a point, and 3 places for thousandths of a point. Minimum Weekly Player Score - Define this only if used by your league by entering in the lowest possible score a player may have each week. Any player that does not perform well enough to score at least this minimum will have their score raised to this defined value. Minimum Weekly Franchise Score - Define this only if used by your league by entering in the lowest possible score a franchise may have each week. Any franchise that does not perform well enough to score at least this minimum will have their score raised to this defined value. Home Field Advantage - Specify a nonzero point award to define a bonus for each home team. This bonus is only applied to regular season matchups, and not fantasy playoff matchups. NOTE: The system allows one and only one point total per franchise per week. If your league wants to use home field advantage and has two or more fantasy games per week of the season, the system will award these home field advantage points to each team that has a home game in a given week of the season, not per matchup the franchise has. Percent of Non-Starter Point to add to each Franchise Weekly Point Total - Specify a percentage value (1-100, without the "%" sign) to use as a multiplier with which to use against each franchises' non-starter points to be added to the franchise score. Count Multiple game in the same week multiple times in the "Points For" Standings Column - Enable this setting if your league uses multi-game (doubleheader, etc.) weeks and you want each game to include each team's "Points For" in the Standings report's display. Counted as ties. Use this option if your league chooses to leave regular season ties as ties for the standings. Decided by "x" selected non-starter/starter at any position/specified position. Select this choice if your league requires that a franchise owner must submit one or more additional tiebreaker players with their lineup. The winner of the tied matchup is determined by the franchise with the greatest sum total of all tiebreaker players. In other words, the point total of all tiebreaker players is added and compared as opposed to comparing the first tiebreaker player for two franchises, then the second, etc. Your initial test will be to go to the Reports > Rules > League Scoring and review your rules. Next to most rules will be a "Test" which you can click to view the proper points for each range. When your league's rules have been defined, the system flags your league to calculate your defined scoring rules against the 2016 statistical data. Depending on when you complete the rules, this process may take up to a few hours. Check on the results by using the Reports > Players > Top Performers/Players Stats report for your league. Here you can click on any of the links corresponding to the weekly points for a given player. This will display a full breakdown of the players stats in relation to the scoring rules you have defined. On occasion, an statistics and/or scoring issue might arise that is less than clear for your league. For this reason we've created a couple of documents to aid in how MyFantasyLeague works with statistics, stat changes, special plays and other related information. Statistics Lifecycle - review league_id&FAQ=820> this document to learn about live scoring results, preliminary & final weekly results, official NFL stat changes, and an overview of special plays. Special Plays - read league_id&FAQ=819> this document to learn how MyFantasyLeague.com scores unique plays that your league may not have addressed in your league scoring. 14. How do I define my league's starting lineup requirements? Each week in the fantasy season your team owners will need to define a subset of their overall roster players to be used as their weekly starting lineup players. The first step necessary to allow for this is to define the overall number of player each team may start each week and the various position restrictions imposed on these starters. To accomplish this task, go to the For Commissioners> Setup > Starting Lineups Setup screen. You will first need to select which types of positions that your league uses. See below for a comprehensive list of available positions. The basic player positions are displayed by default. You may then check any of the boxes to display additional positional options for your league. Team Positions, like Team QB or Team RB - These positions include the TMQB, TMRB, TMWR, TMTE, TMPK, TMPN, TMDL, TMLB, TMDB. This option will award points for any player in that position on the team. Individual Defensive Players (IDPs) – This includes positions such as DT, DE, LB, CB and S. You can set up these to be flexible positions, where you may only require 2 of any of the above positions to be submitted each week. Less Commonly Used Positions like FB or Coach – This option enables less common positions in league such as the Coach or FB. Once you have enabled any additional options for your starters you will then select which positions will be used and set the number of players started each week at that position. Used - Checking this box corresponding any position will enable that position for your league. Uncheck the box to disable this position for your league. NOTE: Only players with checked positions will appear in player lists in the system. Minimum Starters - For each "Used" position (see above) enter a single value to represent the minimum number of players to be starter each week. If your league does not use Flex Lineups (see below), then typically the min. starters value equals the max. starters value. Total Starters - Define both the minimum and maximum number of starting fantasy players for each week's starting lineup. As this is commonly a single value, both fields may be the same. Total QB+RB+WR+TE Players: - Set this value only if your league uses both a flex position and allows partial lineups. It will enforce a maximum value across these positions and is used typically for leagues that would allow partial lineups such that a position (like the PK or Def) does not need to be submitted. Most leagues would not require this if they do not allow partial lineups. Total Individual Defensive Players:- Define this value if your league uses both a Flexible Offense (RB,WR,TE) and the individual defensive players. This will enforce the total starters across all IDPs are submitted. There's still no way to start more than the six players at these positions (this is constrained by the Total Starters option above) as well as at least 2 RBs, 2 WRs, and 1 TE. Here, one owner could start one player at each position while another could start three DBs. Total Number of Starting Individual Defensive Players (IDPs) - If your league uses flex IDP and flex IOPs (offensive), you should enter in the total number of IDPs to start. When defined, this field will prevent leagues from stealing IDP lineup spots to add extra IOP players. Lineup Submission Deadline – here you will define when lineups are due each week. KICKOFF: Kickoff Time for First Game of the Week. All players must be started/benched by the kickoff of the first game of each week. GAMETIME: Players Are Locked At Kickoff Of Their Game. Each player can be started/benched just prior to the start of his NFL game. Are Partial Lineups Allowed? - The default is to not allow partial lineups. This requires a full valid lineup with each submission. However you can still make lineup changes until the lineup deadline. Allowing partial lineups will allow you to not fill the minimum at each position, but will still enforce the starter maximum. Place Added Players In Starting Lineup If Possible? -When selecting this option, the system will attempt to place players added via add/drops (including waivers) into a player's starting lineup if doing so results in a legal lineup. Use “Best Ball” Lineups - Enable this (default is off) to have the system automatically determine and use as starters the best lineup for each franchise roster after the games have been played. Once enabled, franchises will not be able to submit a lineup. Automatically carry over starting lineup from the previous week? At the beginning of the week – this will copy the lineups at the start of each week if no lineup is submitted. Do not automatically copy starting lineups from previous week – this will leave the lineup blank if not submitted for the week. Kickoff of the first game of the week. Kickoff of each individual player's game. NOTE:;If this setting is enabled, the Live Scoring, Live Scoring Summary, Starting Lineups, and Weekly Results reports will NOT be accessible to owners until kickoff of the specified option. Start Bye Week Players - Enable this (default is off) setting to automatically restrict owners from submitting players as starters when they are on bye. Use the Fantasy Sharks Lineup Coach on these franchises to automatically set their lineup if their owner has not done so by Thursday at 6am ET: - Check the corresponding owners boxes to have the lineup automatically submitted for that team each week. This "position" is commonly used to award for a victory by the coaches team. Team Quarterbacks are used be league in place of an individual. For example, a team might draft the Green Bay TMQB instead of Aaron Rodgers. If Rodgers gets injured, his backup will still generate fantasy points for the team with the GB TMQB player. Team Running Backs are used be league in place of an individual. See TMQB above. The site defaults to listing all FBs as RBs. For leagues that prefer to break out the FB position, commissioners must also specify FB scoring rules and manually change individual RBs to FBs via the Change Player Position screen. Team Wide Receivers are used be league in place of an individual. See TMQB above. Team Tight Ends are used be league in place of an individual. See TMQB above. Use this option if your league treats all TEs the same as WRs. NOTE: You will still need to define a copy of the WR scoring rules for the TE using the Custom Scoring System Setup screen. Some leagues prefer a more flexible offensive lineup. If you prefer to start any combination of five RB, WR, and TEs, for example, use this option. This would allow one franchise to start 2RBs, 2WRs, and 1TE and another to start 3RBs, 2WRs, and 0TEs. This position is used only for kicking and punting return stats. As many KRs are also WRs you should use the WR position (and define return rules to it) if you want to assign both KR and WR-based scoring rules to this position. For leagues that prefer to break out the KR position, commissioners must also specify KR scoring rules and manually change individual WRs/DBs/etc. to KRs via the Change Player Position screen. Team Place Kickers are used be league in place of n individual. See TMQB above. Team Punters are used be league in place of an individual. See TMQB above. Use this position if your league treats DTs and Des the same. Team DLs are used to represent a pro team's entire defensive line's stats. Team Lbs are used to represent a pro team's entire linebacker's stats. Use this position if your league treats CBs and Ss the same. Team DBs are used to represent a pro team's entire defensive back's stats. Defensive Team positions can be used for leagues that incorporate ST rules into the DT position or do not use ST scoring altogether. Just include or exclude ST-type rules to the DT position when setting up your scoring. Use this if your league defines a separate ST position that is not part of the DT. If you use a combined DT+ST, use the DT above. When finished, you MUST click on the Save Starting Lineup Setup button in order to apply your changes. 15. How do I setup my Fantasy Playoffs? This most common type of playoff setup uses brackets to define matchup pairs. Each week the winner (and any predefined bye teams) advance and the loser is removed from future championship matchups. To define a standard bracket(s) for your league go to the For Commissioner> Setup > Select A Packaged Playoff Bracket. Designed for leagues that can use one of the six pre-defined, common fantasy playoff brackets. Automatically Create 3rd Place Bracket – check this box to have a consolation 3rd place bracket automatically created. Once your bracket is created you can view this on the Reports > League > Playoffs Brackets . NOTE: Should you need to delete a bracket made in error you can go to the Setup> General Playoff Setup and click the "Delete" box corresponding with that bracket. Some leagues wish to run brackets that may not be compatible with the standard packaged options. In this case you can go to the Setup> General Playoff Setup to customize the brackets. This screen will allow you to define up to 10 separate playoff brackets for your league. While most leagues will only use one for playoffs and some will use another for a "toilet" bowl, it's also not uncommon for some leagues to use additional brackets to determine 3rd place, 5th place, etc. Although not necessary, some leagues have also defined separate brackets for each conference and one final bracket for the championship game. Bracket Name - Enter text to define a name for a bracket. Once defined, the bracket will be used for this league. # Teams Involved - Specify the number of teams that will participate in this bracket. Starting Week - Choose the initial week in which this bracket should begin. # Games in Starting Week - Specify the number of head-to-head matchups to be scheduled for the above "Starting Week". In most cases this will simply be one-half of the "# Teams Involved". However, your league may choose to schedule one or more bye's for the first round. Bracket Winner Title - Enter the text to describe the title of this bracket's overall winner. Set Up 3rd Place Game? - Check this checkbox is you'd like the system to automatically create a third place game for you. If this checkbox is selected, the system will automatically create a new 2-team, 1 game bracket that happens in the same week that the championship game for this "parent" bracket happens, and it will automatically insert the two losers of the semi-final games into this new bracket. Once this bracket is automatically created by the system, you're free to edit or delete it as you would any other bracket. Delete? - Click on this link to completely remove any unused brackets from your league. Keeping partially define bracket is not desirable as it could have unintended side-effects for other brackets. Add to Home Page? - Click on the "Add" link to direct you to the Setup> Home Page Modules & Tabs Setup . Here you can add the Playoff Bracket to your currently used modules. See Home Page Setup FAQs for more details. After Creating custom brackets you will need to set up the scheduled of games on the Setup> Playoff Schedule Setup. If using the packaged brackets, it will not be necessary to adjust the matchups for your league, as they are populated automatically. This screen can be used however if you customize your brackets and wish to have specific matchups. For the first round, you'll be required to specify the specific seeds for each game. It's common to schedule the highest and lowest seeds like this: Seed #1 vs. Seed #4, Seed #2 vs. Seed #3. Of course, you are free to seed your teams as needed. NOTE: If your league awards a first-round bye to one or more franchises, be sure to not schedule these teams in the first round. You can also use this screen if you have brackets for games such as 5th place. You would use the drop downs to enter the "Loser of Game X" vs "Loser of Game Y" from your initial bracket to automatically have these teams fill in. This will save you a step from having to manually seed these during your playoffs. For all standard playoff brackets, where you simply have 1 bracket created and are not setting up multiple brackets per Conference (or Division), you can use the Setup> Automatically Seed Playoff Brackets. Select the Criteria for your top seeds and the sorting options used to determine these seeds. You can then view the breakdown on the Reports > League > Projected Playoff Seeding. NOTE: This feature will only work for leagues that have one main bracket per league. In other words, if you use one bracket per conference (or per division), this feature won't work for your league. If you try out this feature, and it doesn't seed teams exactly how you wish, then can always use the Manually Seed Playoff Teams option to manually over-ride whatever seeds the system generated for you (be sure to uncheck the auto-seeding options on the Automatically Seed Playoff Teams setup screen). This feature will not work for consolation brackets or toilet bowls. Those will need to be manually seeded. Prevent non-playoff teams from submitting waivers and doing trades once playoffs are seeded? - Enable this option to prevent the non-playoff teams from performing transactions once the teams are determined for your playoffs. Some leagues wish to have the lower seed play the higher seed. In this case you will wait until AFTER the first round of playoffs are complete. Then you will not re-seed teams (as that would alter previous weeks matchups), but instead use the Setup > Playoff Schedule Setup to adjust the next round of matchups. For example, in a 6-team bracket, the #6 vs #3 Championship 1 game – the #3 seed wins. You will set up the CHAMPIONSHIP WEEK 15 SCHEDULE to be Winner of Championship Game #1 vs Seed #2. You are a deluxe league. Simply select each seed from the list of teams and assign accordingly. NOTE: If your league has multiple brackets, the seed positions are independent from bracket to bracket and always start with seed #1. Furthermore, if the winners/losers of one or more brackets are then seeded into another bracket, you will need to use this screen once the 'preliminary' bracket has been completed (and the teams are known). This style of playoffs is similar to the above single-elimination bracket, however, two teams play against one another for more than one week (typically two). The winner is determined by adding the scores for each franchise across the defined weeks. As in single-elimination, the loser is removed from future championship matchups. Currently h2h multi-week playoffs are not automatically supported by the system. As a result, the simplest way to use this playoff format is to have each playoff owner submit their lineup and manually add up the point values across weeks as necessary. The Reports > Standings > Weekly Summary report can be used as a good reference for each franchise weekly score. NOTE: Turn off the option to on the Setup Starting Lineup Setup to copy your lineups if you do not wish to have all teams accrue points during the playoffs. In this scenario, three or more teams play in a given week and a subset advance to the next round. Like H2H multi-week, this style is not automatically supported. Also like H2H multi-week play, the best way to offer this is to have each playoff owner submit their lineup and use the Reports > Standings > Weekly Summary report to determine which team(s) advance. Only allow these advancing teams the ability to submit another lineup. NOTE: Turn off the option to on the Setup > Starting Lineup Setup to copy your lineups if you do not wish to have all teams accrue points during the playoffs. In total points playoffs, each franchise participant submits a weekly lineup for the duration of the playoffs. At the end of the playoff term, all weekly lineup scores are added together and the franchise with the most total playoff points declared the winner. This playoff format is supported by having each playoff owner submit their lineups each week and manually add up the point values across weeks as necessary. The Reprots > Standings > Weekly Summary report can be used as a good reference for each franchise weekly score. While any combination of the above is possible, the most common approach is to use a head-to-head, single elimination (#1) with a total points (#3) system for playoffs. To setup a combination playoff league, please see the individual setup requirements as detailed above. NOTE: During the playoffs, if owners continue to submit their lineups, regardless of matchups they can continue to accrue points each week. These will be displayed on the Weekly Summary. 8 total teams in league, top 4 teams advance to playoffs, bottom 4 teams advance to loser bowl. Regular season concludes with week 14. Use the Setup > Select a Packaged Playoff Bracket to set up both of your brackets. (after you save the first bracket simply re-access the page to generate your 2nd bracket). You can seed your championship bracket using either the Setup > Automatically Seed Playoff Teams or the Manually Seed Playoff Teams option. For the toilet bowl you will need to use the Manually Seed Playoff Teams option. 12 total teams in league, top 6 teams advance to playoffs. Regular season concludes with week 13. Use the Setup > Select a Packaged Playoff Bracket to set up your bracket. *NOTE: In this example, there are still only two first-round matchups defined. Two teams will have a first-round bye. You can use the setup > Automatically Seed Playoff Teams to seed your bracket. 24 total teams in league (2 conferences/divisions), top 12 (6 in each conf/div) advance to playoffs. Regular season concludes with week 13. Use the Setup > Select a Packaged Playoff Bracket to set up all 3 of your brackets (after you save the first bracket simply re-access the page to generate subsequent brackets). After your brackets are defined you will use the Manually Seed Playoff Brackets to set up brackets #1 and #2 after week 13 is complete. 16 total teams in league, top 8 advance to playoffs. Additional 3rd, 5th, and 7th place games defined. Regular season concludes with week 13. Use the Setup > Select a Packaged Playoff Bracket to set up your main bracket and 3rd place game. You can then use this screen to set up your 5th and 7th place brackets. Once your brackets are defined you can go to the Setup > Automatically Seed Playoff Brackets to seed your championship bracket for your league. For your 5th and 7th place brackets, use the Setup > Playoff Schedule Setup to arrange these matchups for the loser of the initial round brackets. 4-team loser bracket, where the loser advances to the next round. Finally, use the Setup > Manually Seed Playoff brackets to seed these teams. The loser of each game will advance and the worst team will be declared the Flushmaster!